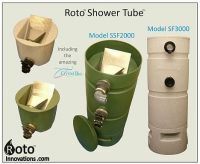 The Roto Innovations Shower Tube with 300 micron Sieve, Complete With 50 litres of Crystal Bio and Fittings. Bacteria living on all submerged biological filter media will multiply and colonise the media at an improved and faster rate if oxygenated. This is why shower filters are the best form of filtration for koi ponds, the shower media, in this case Crystal Bio is used in a Shower Filter and exposed to the air, and as air costs nothing to produce you do not need to run an expensive air pump, like you do with other media, to aerate your filter media and improve the size of the bacterial culture. Every piece of Crystal Bio has a protected area or static zone designed to be the perfect environment for micro animals, not just bacteria. Once colonised each piece of Crystal Bio will contain millons of these micro animals, all filtering many thousands of times their own volume every minute, searching for their food source. These micro animals will feed on small particles such as, fish waste, dead bacteria, algae and organic matter. By using Crystal Bio on your Koi pond today you will see the benefits of sparkling healthy water, high in oxygen content with low BOD (Biological Oxygen Demand). The surface area of crystal Bio is massive, up to 10 times the surface area of most well know plastic media with 100 litres of Crystal Bio equalling up to 1000 litres of plastic media, imagine the cost and space of that filter. The Shower Tube with Sieve is a complete biological filter and sieve in one unit. 1.5" solvent hosetail for flexi hose up to 1.5"
The outlet is open on this model ready to accept the sieve waste pipe and valve. The roto Innovations Sieve has a 300 micron screen capable of handling solid waste directly from your pond pump. 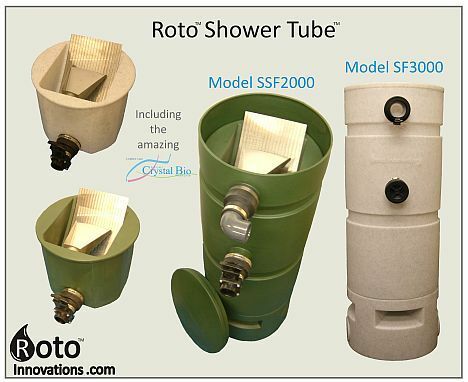 The Roto Shower Tube With Sieve also includes a fitted anti splash, thermal retentive lid.